The story of David and Goliath is wonderful on many levels. The face value of the story is that God works through His people to do amazing things. But there is so much more we can learn from 1 Samuel 17 and this magnificent story. Here are some practical life lessons we can learn from David’s submission to God. Without complaint David obeyed his father when Jesse asked David to take food to his brothers and check on them (1 Samuel 17:17-20). Apparently David didn’t have a great relationship with his brothers. The way Eliab (the eldest) spoke to David when he arrived at the Israelite camp seems to indicate there was a great deal of tension among the siblings (1 Samuel 17:28, 29). When David’s father asked him to do a job, David obeyed (1 Samuel 17:20). When David was prompted by his spirit to take a stand for the Lord, he did it without hesitation (1 Samuel 17:26, 29). When Saul asked David to take his armor for the battle, David apparently tried to comply, but had to respectfully decline (1 Samuel 17:38, 39). God has placed authorities over each one of us. We should be willing to obey in every situation. There are times when obedience is not possible (Peter spoke of this in Acts 5:29). But submission is necessary in these cases. For example, while Daniel could not obey the king’s command to refrain from worshiping God, he did submit to the punishment that was enacted upon him. God gained a great victory before the people of Babylon because of Daniel’s submission, not because of his refusal to worship the king. In this story of David and Goliath, we see David as a young man of obedience. God calls us to be obedient servants, not tyrannical rebels. When David arrived at the camp he was shocked to hear the words of Goliath. He immediately thought that something should be done to stop the blaspheming giant (1 Samuel 17:26). It almost seems like David did not notice that everyone else was cowering in fear. His first reaction was that there was a cause for which to fight. David believed that God would gain the victory (1 Samuel 17:26, 32, 37). David wanted to be part of God’s plan. He trusted that God could and would use him. How refreshing to think that someone would volunteer to give his service to the Lord. I am not sure who first said it, but I have heard the sentiment that asks, “has God called you to sit at home and not take the Gospel to a dying world?” Many people must believe that is what God has called them to do because that is exactly the way they have responded to Christ’s call to carry His Word to the world and make disciples. David was able to trust the Lord because the Lord had led in many ways in the past (1 Samuel 17:34-37). David knew that he could fight Goliath even though he had never faced a giant in the past. David used the past victories to give confidence that God would continue to work in and through him. You may be facing some great obstacles in your life today, but what have you seen God accomplish in the past? Don’t you think He is able to continue to work in greater ways in the future? Allow those past victories to encourage you to attempt greater things for the Lord. Maybe gaining new ground in your spiritual life is not what you need right now. Maybe you just need to get back to where you once were in your relationship with God. Get back there by being inspired by God’s faithfulness to you in the past. Then boldly step forward into new victories God wants to give you. We know a few of David’s talents by this point in his life. We know that he was a skilled musician and that he was a capable shepherd. Music didn’t seem to be the tool to pull out when facing a warrior giant. David surrendered his shepherding skills to do a work for the Lord. It is amazing to me to see people with wonderful talents and abilities sit back in church and not get involved for the Lord. They will even say things like, “if I could sing like Mrs. B. or speak like the pastor, then I would do something for the Lord.” Yet, these same people could be used to win children to the Lord by love and affection if they would step into a Sunday school class. Or they could use their computer skills to share the Gospel through the Internet or keep the church’s computers running properly. It takes a simple step of faith to use their skills for the Lord. David had already demonstrated his great musical talent in the previous chapters of 1 Samuel. But that very public and prestigious skill of playing the harp did no good in this situation. What won the day was David’s ability that was honed while being an unknown shepherd boy who dedicated his life to living with stinky sheep. 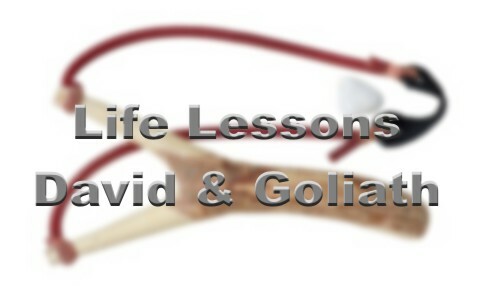 What life lessons have you learned from the story of David and Goliath? Share your observations in the comments below. Great life application here David. I was so encouraged to read this and see how such a familiar story can be so relevant even today. I especially like and can relate to the “Surrender Your Talents” section. You are a blessing my friend. This is a tough time for our family. David’s message on ‘Looking at Past Victories’ is truly an inspiration, strengthening my faith in God’s capabilities to take control of things. It helped me realized once again that He is always with us and will fight the battle for us. Next post: What Does The Bible Teach About Kind Words?